One of my New Year’s resolutions this year is to only use cloud services when absolutely necessary. Web apps are great tools when you need to collaborate at a distance, but other than that you’re better off keeping your work on your own machines, for privacy reasons if nothing else. The trouble with the cloud, however, is that it’s too easy. While we know we shouldn’t be putting information that needs to be safely secured on our own computers in the hands of the likes of Google — no offense Google — web apps are only a click away and it’s often easier to just clink-and-use than it is to stop what we’re doing to take the time to look for something that’ll serve our purpose while keeping our data safe and sound on our own hard drives. I’m guilty of this, and most likely, so are you. This resolve was put to the test a few days after the holidays, when I realized I was having trouble remembering all the things on the schedule I keep in my head and decided it was high time I started using a calendar. My first impulse was to click to Google’s always handy online calendar, which I’ve used from time to time, but just before I clicked I pulled my hand from the mouse remembering my resolution. It was time to do some calendar hunting. And because I’d saved myself from Google’s always-at-the-ready suite of online tools, I started my search with…well, Google. As anyone who knows me well will attest, sometimes my thinking has trouble getting out of reverse. 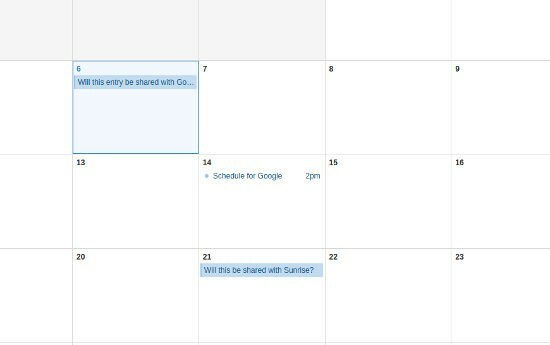 Sunrise Calendar extension for Google Chrome and other platforms allows you to work offline, but shares your data on the cloud. All entries made on Sunrise Calendar are immediately shared with it’s parent cloud calendar, and vice-versa. The good news is that Sunrise is a perfectly functional calendar that does everything a calendar should do. The bad news is that for about a year it’s been a Microsoft product — a deal breaker for me if ever there was one. But that isn’t its only drawback: It also offers no escape from the cloud. 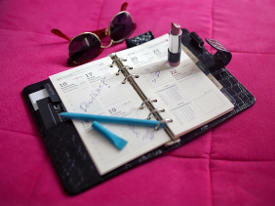 Sunrise Calendar was originally developed exclusively for mobile devices and is popular on iPhones and Android devices. As you might expect from what is essentially a mobile app, it requires a connection with an online calendaring program, like Google Calendar or Microsoft Outlook, to function. You can work offline all right, but as soon as you connect to the Internet it’ll blab all it knows about you to its configured online calendar. Just to be sure this is the case, I checked it out. Sunrise Calendar and my Google Calendar are now in perfect sync, just as Google — which wants to sync the world — would have it. I should say, they were in perfect sync, since Sunrise is no longer on my hard drive. 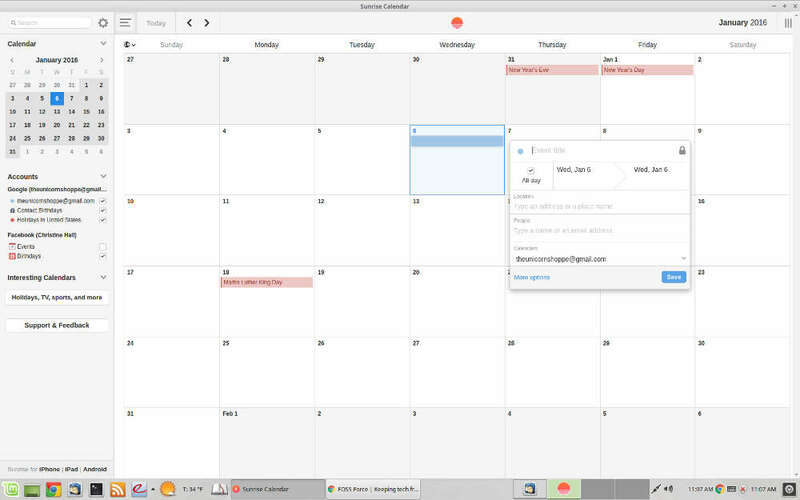 Week view on KDE’s KOrganizer calendar application. Next up I tried KOrganizer, which is basically the calendar component of Kontact, KDE’s personal information manager suite. I was keen to have a look at it, because back in the days when I was new to Linux and running good ol’ Mandrake, I used KMail as my absolute favorite email client for several years, and still have fond memories of it. Although I’m no longer a KDE user — these days Xfce is my desktop of choice — that’s never stopped me from running KDE apps in other environments. Finding KOrganizer using Synaptic was a snap, and a few clicks later I was ready to see where in the menu Mint dropped it. It was under “Office,” right where I expected it. After opening KOrganizer I had to click through a couple of error messages to get to the main screen. Evidently the program doesn’t speak Xfce as fluently as it speaks KDE and was befuddled because it couldn’t find the system tray. Other than that, it worked splendidly. I especially like the fact that the work area to the left of the calendar graphic offers thumbnail calendars for three months — four if you want to squeeze the calendar against the right wall — which can come in handy for planning ahead. The calendar is also intuitive and easy to use. I was ready to adopt KOrganizer then and there, but I thought I’d be remiss if I didn’t at least give Evolution a try. These days Evolution is the full fledged PIM for the GNOME desktop, but back when I started using Linux it was somewhat independent, owned and maintained by Ximian, a company closely tied to GNOME which was eventually purchased by Novell. Evolution’s main claim to fame, then as well as now, is that it can connect to Microsoft Exchange Servers, although establishing the connection is said to be a daunting task. Evolution is also the first email client I ever used in Linux, and it was never a favorite. 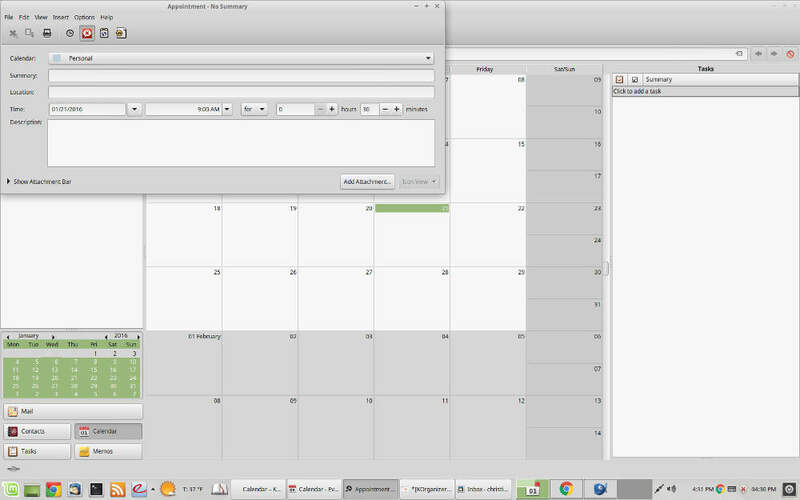 The calendar screen for the GNOME personal information manager, Evolution, with the appointment editor open. The Evolution calendar isn’t available as a stand alone app, at least not in my distro’s repository, so I installed the entire Evolution suite, including the email client, as a single package. 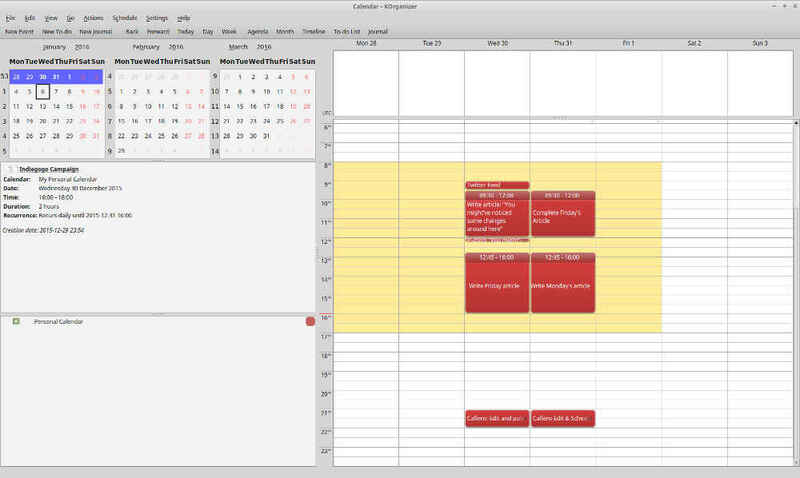 The calendar is functional enough and is just as intuitive as KOrganizer. However, for some reason — probably connected with the numerous crashes of the email system I experienced back in 2002 — I don’t like it and pretty much knew going in I wouldn’t be using it. Personal prejudices aside, it’s not a bad calendar and not all that different from the KDE calendar. As with KOrganizer, it has the ability to show thumbnail images for several months, although the thumbnails are wider, which means that keeping three months onscreen greatly reduces the size of the main calendar, but two works just fine. Finally, I took a look at Lightning, which is not a stand alone application but is the calendar and scheduling extension for the Thunderbird email client and the SeaMonkey Internet suite. This is another calendar app with which I have previous experience, as I used it at a business I operated from 2004-2012. As was the case with KOrganizer and Evolution, the straight forward design is easy to use and is intuitive. To my eyes, it also has the most attractive GUI of all the calendars I tried. On the downside, it only displays one monthly thumbnail in the left screen, although it does offer the ability to navigate to future or previous months by use of navigation arrows. Also, it can only be considered as an option if you’re using Thunderbird or SeaMonkey. The Lightning calendar extension integrates tightly with the Thunderbird email client. When all is said and done, a calendar app is a calendar app is a calendar app. Except for Sunrise’s propensity for sharing secrets with its cloud based parent calendar, there’s not a nickle’s difference between any of these apps; they all do the same thing in basically the same way. I’ve put my affinity for KOrganizer aside for the time being and have settled in with Lightening, mainly because of its tight integration with Thunderbird. Among other thing, that means I won’t have to remember to open it, as it’ll be there automatically as a tab on Thunderbird, so I might even find myself using it. I’m not uninstalling KOrganizer however. I might yet change my mind. Sometime this week, FOSS Force will be going live with the second phase of our Indiegogo fundraising campaign. You can help us get a running start by making a donation now by becoming a subscriber. Problem with all of them is the inability to sync with mobile devices. World is going mobile and one needs to be synched across the devices. I’m also looking for a client Calendar application. So far, I’ve settled on KOrganizer and Kaddressbook for contacts. The reason is simple (and it’s what Abhishek was talking about). You can use three pieces of software to sync all of it with all your devices, but without the information ever leaving your home. 4) Configure the URL of your server/desktop and your password on your your devices. 5) Now you are fully synchronized. I love Lightning with Thunderbird. How about using owncloud? It has calendar functionality built in, you can sync with it using evolution calendar or california or gnome calendar, it integrates well with Gnome, using DavDroid on Android fixes mobile access, or you can just use web interface. Your contact list gets integrated as well as tasks/todo. I used to use an app called iCal by Sanjay G. It was written in tcl/tk. It could sync (not just export/import!) to a Palm device on Linux. This was in 95, before Mozilla, KDE, Gnome, etc. All of them play just fine with online services, if synchronization is your thing. If you want to keep it more local, it’s trivial to set up a caldav service for your local network. Were you thinking about something else? BTW, the whole kdepim is a lifesaver suite. I regret setting some small businesses with evolution. After an upgrade to a newer version “the buttons disappeared”. Kdepim offers not only customization, but also consistency. There are a couple of things you are overlooking. First, Sunrise Calendar obviously does sync with your mobile devices, since it uses Google Calendar or Exchange. Of course, the easy way to get synchronization is to use the cloud, which is something the author was trying to avoid. That brings us to the second point, which is that synchronization is generally just about using a common server side application. Being able to use these applications standalone doesn’t preclude the ability to sync with some kind of server. I haven’t actually used KOrganizer, but my guess is that all of these calendars can sync with mobile devices. I have Lightning on my Thunderbird installation at work, and it syncs with the Android phone I have issued from work. That is because they are both synched with the Exchange server at my workplace. Since it’s Exchange, I use DavMail to sync Thunderbird/Lightning, but of course there are other PIM servers that can be used. Lightning can certainly sync to Google Calendar as well, if you want to use the cloud. Of course, the key to not using the cloud and still syncing the calendars on your various devices is to set up your own PIM server rather than relying on a cloud version. This can be done on your desktop or on a local server, and it can even be made available over the Internet if you want that. OTOH, Orage for XFCE still works excellently for the vast majority of less-sophisticated calendaring tasks. Having tried to find a calendar that plays well with Xfce, I tried, in addition to the above, remind (and tkremind) and zim. Both allow storage on the users hard drive, and work quite well. I have been using remind for about six weeks, and it works very well for my own use. Like suggested before, I would also suggest OwnCloud. I am using OwnCloud. It is Open Source using Open Standards, making it so much easier to use it on any device. 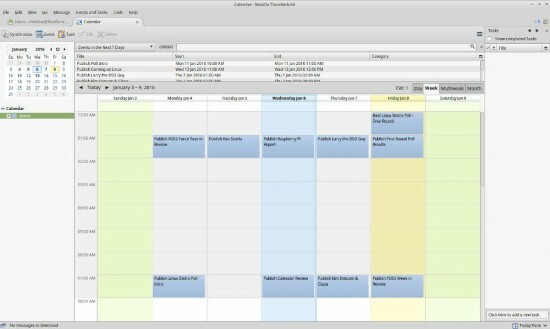 Besides just your calendars it also can sync your tasks, contacts and files. It also allows you to share it with others, which to me is quite crucial. This is not just on your own server, but with anyone else that also has OwnCloud. Really give it a go. Actually, Lightening syncs great with my Android phone. I use an online service called Memotoo for contacts and calendar events from Thunderbird. It syncs automatically with every change. From Memotoo, I use SyncML/ Synthesis to sync contacts, calendar events, SMS messages, tasks and notes. Unlike Thunderbird, it is a batch and not automatic so you need to remember to use it but it works great. Also, the support at SyncML for their pro product is great. For years I’ve been using Osmo for Calendar, Contacts, Tasks (to do) and Notes. Fortunately I do not need synchronisation between devices. So, the thing was invented long long long time a go, and it is just one upgrade of it. One more thing, if it is last Windows for PC it is a chance for Linux guys to overtake that part of market. One advantage of Linux is to have it on same PC where you have your Windows and then to save your files on Windows, … it is just something that should people be informed about, and gently involved into world of Linux. 1: create a conduit protocol (I’d suggest a superset of the old Palm-conduit, just to make development easier/quicker) that can sync Android devices to desktop PDA apps. Make sure those apps like KOrganizer, JPilot, etc that already have the right concept can sync to the updated protocol. Find a way to add the protocol *without* having to root phones (I’m presuming it has to run at system level, rather than just within the apps themselves). Not sure which one would take more work. I’d like to see the first, since it seems silly to send your updates half-way around the globe just to send it back to a device that’s 2-3 feet away from the computer. Although I expect the DayRunner/Timer folks would *love* to see option 2 become popular. The killer feature of Google Calendar, Yahoo Calendar, Outlook.com Calendar, etc… is the ability to access your calendar from anywhere on any device with an internet connection. So I would look at Owncloud or something similar instead of a desktop application. I’m actually a subscriber to the sandstorm.io FOSS web app hosting service, and they’re planning to add calendaring eventually. Paper works as the Franklin-Covey people say. Now, we know what each other’s schedules and it’s harder to do that with paper. Some times some things come to the end, and that is the way they work, well if they don’t evolve into something better. Like calendar thing, you know.